Usually when readers ask whether the things that happen in my books have happened in my real life, I tell them that only small bits of my life work themselves into my novels. Listen!, however, is something else again. While all the human characters are fictional, the setting (Eagle Lake, near Charlotte, North Carolina), is real. It's where I live. Coyote is the wild dog I first met in August, 2000 in the woods across the lake from my house (which is Charley's house in the book). I named him Coyote because that day he looked far more like a wild animal than like anybody's pet. Much later I learned from the researchers at Wolf Park in Indiana that Coyote had probably never lived with humans and was, therefore, really wild. The process of persuading him to become a member of our family is reproduced as accurately as possible in the pages of the novel, though it actually took a great deal longer. It was three full years before Coyote would come inside the house! The other dogs that appear in the book are the dogs that lived at Eagle Lake when I first encountered Coyote. All but Sadie have their real names in the book-Coyote's beloved golden retriever, Casey, was one too many "C" names for readers to keep track of, so she became Sadie instead. "Tree" is real, too-a noticeable presence at the edge of the lake. Living at Eagle Lake for seven years has taught me a great deal about listening. My husband took this photo of Coyote and me (it also appears on the back jacket flap). Those of you who can read the facial expressions of dogs will see quite clearly that Coyote did not enjoy the photo shoot. (When he's happy, his ears are up, and though we took picture after picture that lovely spring day last year, not a single one showed his ears in happy mode. He was patient, but he was not happy.) Here's another photo of him resting under one of our azaleas, just to show what he looks like when someone isn't trying to make him stay where he doesn't really want to be. Linda Carmichael Rose, a good neighbor at Eagle Lake who designs theatre sets and is a partner at InArtDesigns, drew the Eagle Lake map for the book and the line drawing of Coyote that appears on the title page. I'm enormously grateful for her help! As you read Listen!, you can walk the woods trails with Charley, visit the Pine Grove, cross the causeways between the lake and its ponds in your imagination, just as Coyote and I do for real every day. 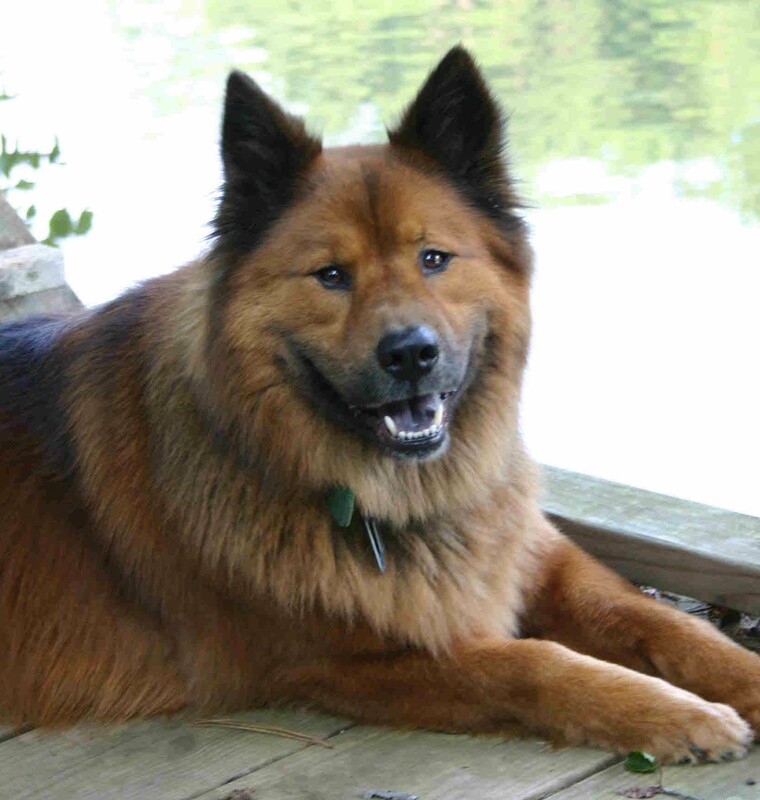 These days Samantha, the chow-shepherd shelter pup we brought home as a companion for Coyote when he'd been with us a year, goes along. And so, surprisingly, does Puck, the golden tabby cat who came to live with us last fall.